In the Installation Destination screen, the following error message can appear at the bottom: No disks detected. Please shut down the computer, connect at least one disk, and restart to complete installation. If your system uses a hardware RAID controller, verify that the controller is properly configured and working. See your controller's documentation for instructions. If you are installing into one or more iSCSI devices and there is no local storage present on the system, make sure that all required LUNs (Logical Unit Numbers) are being presented to the appropriate HBA (Host Bus Adapter). For additional information about iSCSI, see Appendix B, iSCSI Disks. In that case, you will have to perform a driver update before starting the installation. Check your hardware vendor's website to determine if a driver update is available that fixes your problem. For more general information on driver updates, see Chapter 11, Updating Drivers During Installation on IBM Power Systems. You can also consult the Red Hat Hardware Compatibility List, available online at https://hardware.redhat.com. 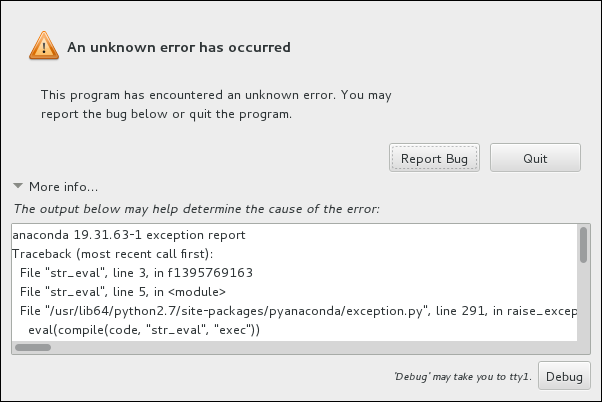 If the graphical installation program encounters an error, it presents you with a crash reporting dialog box. 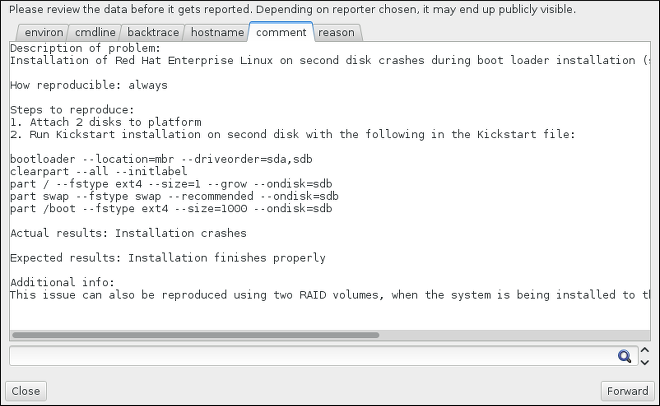 You can then choose to send information about the problem you encountered to Red Hat. To send a crash report, you will need to enter your Customer Portal credentials. If you do not have a Customer Portal account, you can register at https://www.redhat.com/wapps/ugc/register.html. Automated crash reporting also requires a working network connection. When the dialog appears, select Report Bug to report the problem, or Quit to exit the installation. Optionally, click More Info to display detailed output that can help determine the cause of the error. If you are familiar with debugging, click Debug. This will take you to virtual terminal tty1, where you can request more precise information that will enhance the bug report. To return to the graphical interface from tty1, use the continue command. If you want to report the bug to the customer portal, follow the procedure below. 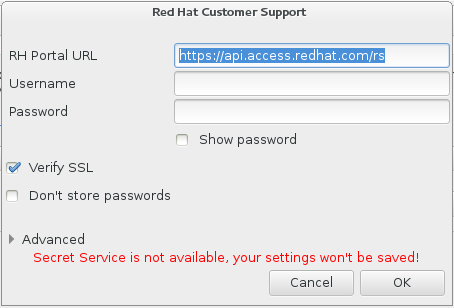 In the menu that appears, select Report a bug to Red Hat Customer Portal. To report the bug to Red Hat, you first need to provide your Customer Portal credentials. Click Configure Red Hat Customer Support. A new window is now open, prompting you to enter your Customer Portal user name and password. Enter your Red Hat Customer Portal credentials. If your network settings require you to use a HTTP or HTTPS proxy, you can configure it by expanding the Advanced menu and entering the address of the proxy server. When you put in all required credentials, click OK to proceed. A new window appears, containing a text field. Write down any useful information and comments here. 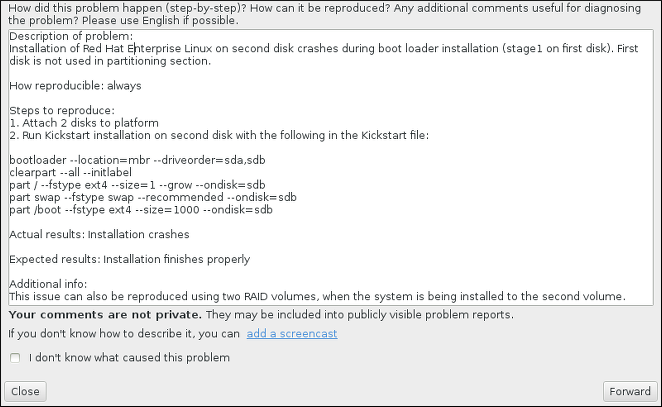 Describe how the error can be reproduced by explaining each step you took before the crash reporting dialog appeared. Provide as much relevant detail as possible, including any information you acquired when debugging. Be aware that the information you provide here can become publicly visible on the Customer Portal. If you do not know what caused the error, check the box labeled I don't know what caused this problem at the bottom of the dialog. Next, review the information that will be sent to the Customer Portal. The explanation you provided is in the comment tab. Other tabs include such information as your system's host name and other details about the installation environment. You can remove any items you do not want sent to Red Hat, but be aware that providing less detail can affect the investigation of the issue. Click Forward when you finish reviewing the information to be sent. Review the list of files that will be sent and included in the bug report as individual attachments. These files provide system information that will assist the investigation. If you do not want to send certain files, uncheck the box next to each one. To provide additional files that can help find the problem, click Attach a file. Once you have reviewed the files to be sent, check the box labeled I have reviewed the data and agree with submitting it. Then, click Forward to send the report and attachments to the Customer Portal. When the dialog reports that processing has finished, you can click Show log to view details of the reporting process or Close to return to the initial crash reporting dialog box. There, click Quit to exit the installation. To debug installation problems you can set the inst.debug option to create log files from the environment before the installation starts. These log files contain, for example, the current storage configuration. 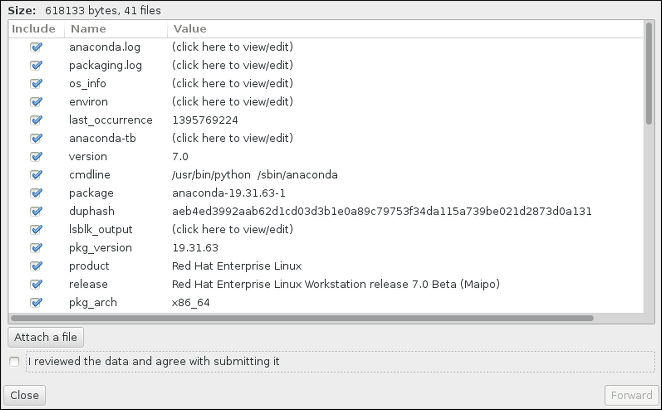 Select the Install Red Hat Enterprise Linux 7.3 entry. Press the Tab key to edit the boot options. For further details, see Chapter 22, Boot Options. Press Enter to start the setup. Switch to the console. See Section 8.2.1, “Accessing Consoles”. If you create partitions manually, but cannot move to the next screen, you probably have not created all the partitions necessary for installation to proceed. See Section 13.15.4.4, “Recommended Partitioning Scheme” for more information.